I spent far more time researching than necessary and eventually, convinced by excellent reviews and a couple cheesy youtube videos, purchased the WeatherGuard . The box is excellent but when dark out – I invariably pull into my campsite well past midnight – it is impossible to see into even with a headlamp. After a more cursory search online for lighting solutions, I decided to build my own and, of course, to have a little fun with it. 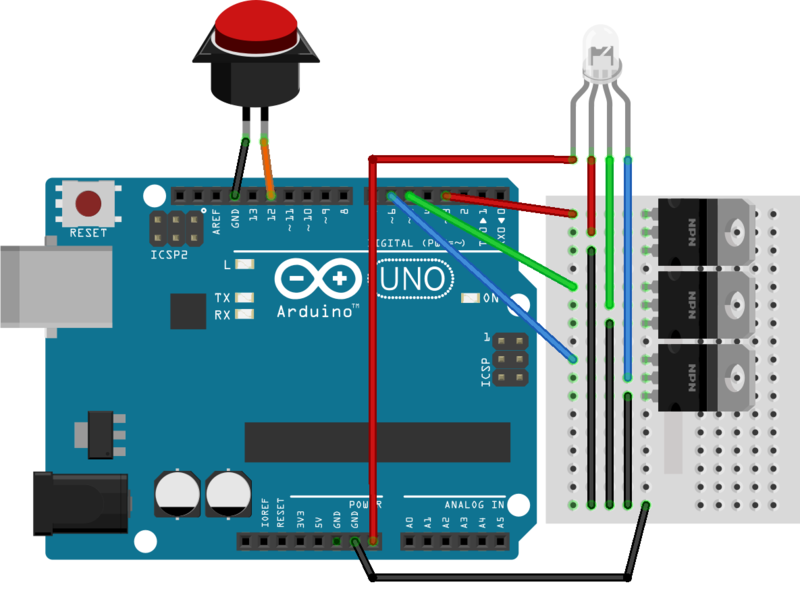 Arduino UNO . I meant to do this using the Pro Micro but while soldering I accidentally melted it a little. 1 Sealed non-addressable 1 meter long RGB LED strip with 60 5060 LEDs per meter. Enclosed by a flexible silicon jacket with an IP65 waterproof rating to protect the LEDs, and multicolor to boot! Arduino enclosure and 3D printed insert to hold a button (sorry, no part number, it was something found in my toolbox). As you can see, I’ve wired the control lines into the PWM slots of the Arduino, as I’ll explain later this is so we can have some fun. The LEDs require 12V and fortunately the Arduino can handle that internally so we don’t need separately regulated supplies. Most vehicles have ample 12VDC sources – I found a place to splice in the radio circuit. This source is hot only in ACC mode so I can’t accidentally burn the truck’s battery by leaving the light on while the box is closed. I ran two wires from here back through the truck frame to the truck box, secured using many zip ties. The LED strip comes with an adhesive back, simply stick it to the lid of the truck box angled down into the box when the lid is fully open. Some two sided tape on the enclosure and a couple zip ties to secure the 12V wires made quick work of installation. I could have made a white light shine into the box without using an Arduino, MOSFETs, or really anything other than a simple switch and the 12V source. It would have been cheaper but it would not have been as fun or as functional. Next, we need to take advantage of this strip’s ability to be any color at all: Keep holding the button for 3 seconds to enter DiscoBrett(tm) mode. This is just the first revision, eventually I want to augment this code to blink instead of simply change, wire it into the speakers and have it adjust brightness based on volume, or maybe something more. TruckBoxLight from Brett Heliker on Vimeo. That’s all for now. Have any ideas for me? Send me a message.